« Living with the Sun » is a multidisciplinary school program about health, citizenship and sustainable development. It can be used by any seasoned or starting teacher, with or without scientific background : the teaching guide is a complete auto-learning resource. Every step is described and illustrated in details. Every indication – the specific objectives, the length, the materials, the procedures – is laid out. Although the written traces always have to be elaborated with the pupils, token questions and conclusions are included in the guide to facilitate the teacher’s work. Scientific and educational notes are added in each session. 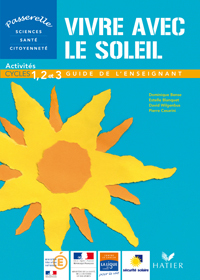 These notes can take the teacher to the « lighting pages » in the second part of the guide. Education tips help the teacher know better and embrace the investigation approach, as recommended in official programs. Simple yet concrete explanations, contextualized to each module, describe the different phases of a science session.